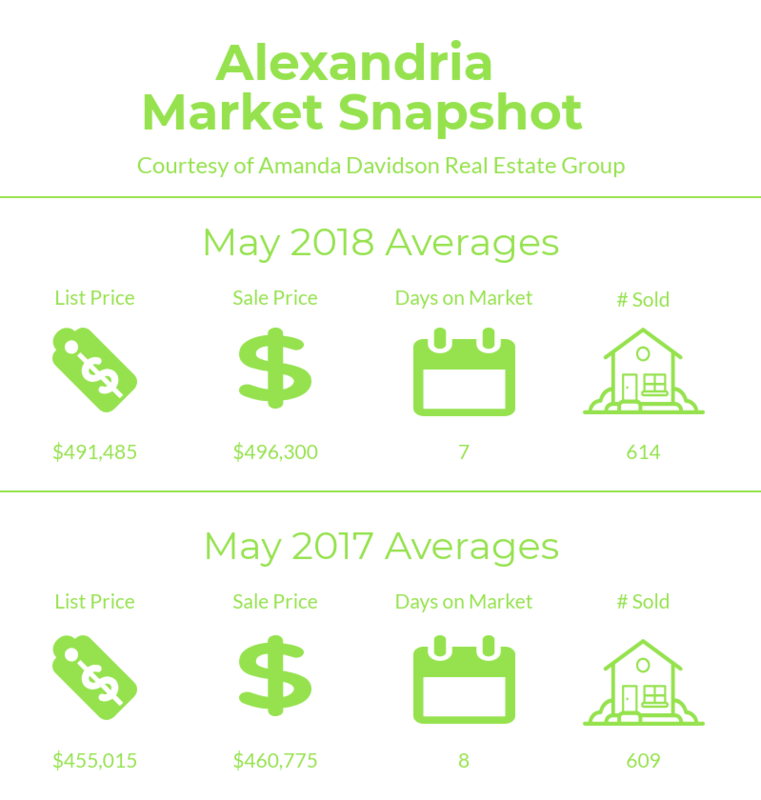 How Did Home Sales Perform in Alexandria in May 2018? Reviewing the same timeframe in the previous year allows us to analyze how the market has changed. Median sale price is up by 7.7% as compared to May 2017. Days on the market saw no measurable change and sale to list price ratio remained consistent. As of today there are 857 homes for sale in Alexandria. An increase from 796 at this time last month. The slight increase in inventory is good news for buyers. Supply certainly isn’t keeping up with demand but, any increase is a welcome one in the current market conditions. The lowest priced property is a studio with 471 square feet listed at $100,000 and the highest is a 6 bedroom, 4.5 bath single family home with 8,145 square feet listed at $8,500,000. Current active listings in Alexandria have an average of 35 days on the market, an increase of 4 days as compared to last month. There are currently 804 homes under contract. Median days on the market for the pending homes is 14. Is Alexandria a buyers or a seller’s market? It remains a seller’s market. Supply continues to struggle to keep up with demand and although interest rates have increased so far there is no sign of buyers slowing down. It’s an excellent time to sell your Alexandria home. Just keep in mind that while the market is favoring sellers that doesn’t mean proper preparation and exceptional marketing isn’t key. Buyers know they are in most cases paying top dollar and in turn they expect a product that has a reasonable amount of updates, shows well and is priced correctly. Sellers who overprice their homes will still see the market react in the form of the home sitting and becoming what we like to call stale bread. No one pays top dollar for stale bread! With the right agent to guide you and the proper marketing plan in place, your home can set a record for the neighborhood. It’s not just about selling, it’s about selling for the highest price in the shortest time possible. Homes that are moving quickly have a few things in common: they are clean and well maintained, reasonably updated, uncluttered, and they are priced according to the current market. As a seller, when you meet these conditions your home will not only stand out from the competition it will also have the best opportunity to sell for top dollar. Buyers have to be prepared to make quick decisions in the current market. Have your pre-approval in hand and work with an agent who has full-time availability to show you homes as soon as they come on the market. Days on the market continue to be extremely low and that means delaying in making a decision can cost you the home you fall in love with. In general, the current market is not conducive to negotiating power for buyers but, there are some homes that will be an exception. If the home you want has only been on the market for a couple days be prepared to make your highest and best offer upfront, it’s the smallest details that are making one buyer stand out from the next. Reach out to Amanda at 703-431-3755 or email amanda@amandadavidson.com to talk about the marketability of your home. Market reports provide general information but, they sure don’t replace a custom market analysis from an agent who understands the intricacies of the Alexandria real estate market. Every home and its unique features influence where it should be priced. Achieving top dollar for your home regardless of the current market conditions is always our goal.